With the announcement of the Nokia Lumia 900 expected to be sometime today, it really is no surprise that we are hearing lots of information about the device. 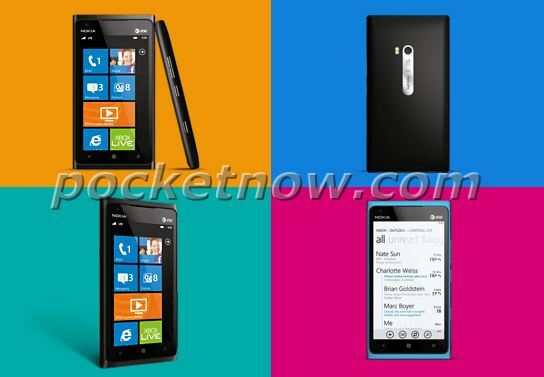 To add to the hype Pocketnow has gotten their hands on what look like the first offical images of the Lumia 900. The pictures depict the Lumia 900 with the AT&T logo, which is on par with the rumors that the device is coming to AT&T. The devices in the images do not seem to be metallic as was reported by the New York Times. The devices look practically identical to the Nokia Lumia 800 which has a polycarbonate body with a few minor differences. The Lumia 900 is expected to feature a 4.3-inch CBD AMOLED screen as opposed to the 800′s 3.7 inch screen, a front facing camera and the LED flash was moved from the top to the left of the device. The device will come packaged with a few apps including: ESPN, Spotify, Nokia Maps and Nokia Drive. Can’t wait to see this beauty in action. Hopefully we will get something good that we can share from hyde13 soon. Written by: WP7GIRL on January 9, 2012.